The first A350-1000 took off this morning for its maiden flight at Blagnac in Toulouse, France at 10:42. The A350-1000 is Airbus’ largest and most powerful twin-engined airliner ever – and the world’s most fuel efficient large wide-body plane. Equipped with specially developed Rolls-Royce Trent XWB-97 turbofans, the A350-1000’s first flight is taking place over south-western France. Benefitting from the experience of the original A350-900 test campaign (accomplished in 2014), the A350-1000’s development programme will be shorter – under one year for the three aircraft. The overall campaign will culminate in the type’s certification followed by its entry into airline service scheduled for the second half of 2017. The A350-1000 is the latest member of the Airbus leading wide-body family, together with the A330neo, offering unprecedented levels of operating efficiency, low noise and true long-range capability. As well as having a longer fuselage to accommodate 40 more passengers than the A350-900, the A350-1000 also features a modified wing trailing-edge, new six-wheel main landing gears and more powerful Rolls-Royce Trent XWB-97 engines. The A350-1000 embodies all of the fuel efficiency and ‘Airspace’ cabin comfort of the original A350-900 – but with extra size perfectly tailored for our customers on some of their busiest long-haul routes. 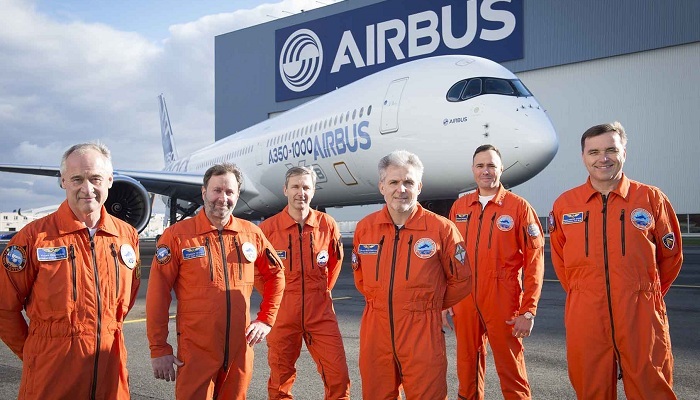 To date 11 customers from five continents have placed orders for a total of 195 A350-1000s.